the race, held on saturday 6th september, will be preceded on the friday with a talk by bernard moerman, ds of the johan bruyneel cycling academy team, and steve bauer, ds of team race pro (yes, that steve bauer). they will discuss training tips and physical fitness - access is free and open to the public. in what must be a logistical nightmare, 8am saturday 6th september allows the opportunity for all and sundry to take part in the univest grand prix sportive; 100km over the same roads as followed by the professionals later that same day(!) team sparkasse member, christian lademann, a guy with a somewhat impressive palmares will take part in the sportive along with, it's hoped, a few other notable riders. all benefits from the sportive will go to the penn foundation, a sellersville-based non-profit organization that provides comprehensive behavioral healthcare to persons in need of hope, healing, and compassion. winner of the sportive can expect to garner a specialized bicycle along with products from sportique. 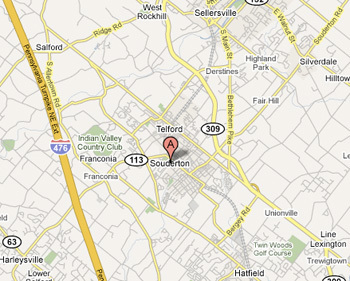 the professional race starts at 10:50 and covers a 100 mile (162km) route through bucks and montgomery, before an uphill finish in souderton. the event has attracted a substantial field of 26 teams, headed by garmin chipotle and amore vita/macdonalds. last year's was pretty exciting, though the commentary was somewhat of an acquired taste. and as if that weren't enough, there are also children's sprint races on the saturday along main street, while the pros are 'out in the country'. on the following day, sunday 7th, the univest criterium of doylestown provides a second day of fast-paced, circuit racing starting at 11am, contrasting with the european style of saturday's event (coverage also on universalsports.com - broadcast times for both races have yet to be listed). with the level of local support received by all these events, it would be hard to argue that american cycle racing has a lot to learn from the europeans; perhaps the heritage isn't there, but even the tour of flanders had to start somewhere. it would be nice to see a some european teams take part in such events, but there's time for that to happen in the future. already team columbia have directed mark cavendish to race in missouri rather than front his team in the tour of britain. it also seems the ideal way to lead us back into the classics at the end of the european season, praticularly as the web starts to open up live coverage of a host of international events that we've never even heard of before. maybe if thewashingmachinepost coffers receive a substantial boost between now and september 2009, i could pop over to souderton and ride next year's sportif. that's worth a thought. univestgrandprix.com all times in this article are american eastern standard time, around five hours behind british summertime. the village of bruichladdich has one shop - well, one shop and a photographic studio. and a distillery. but the shop has, certainly since i moved to islay, been known as bruichladdich mini-market; it comprised a delicatessen, a general store and a post office. in the early years, at the end of the sunday ride, the mighty dave t and i used to take a pedal to the croft kitchen in port charlotte for an espresso and a piece of carrot cake. or during the summer months, we'd go out to club headquarters at the old kiln cafe, ardbeg distillery, which was generally enough to sustain us both until we reached our respective homes for a dark corner into which one could recede. however, the fly in the ointment was the winter; the old kiln closes on the last weekend of august (this very weekend, in fact), while the croft kitchen, which used to close from october onwards, has lately stayed open until christmas, then closes until easter. this is only to be expected, since the tourist season on islay is relatively short, and there aren't the numbers to support year-round opening. all that changed when debbie took over the running of bruichladdich mini-market. suddenly there was a veritable embarrassment of designer coffees on offer to the struggling cyclist, as well as a corner of the deli with nice chairs and tables at which to sit, and wallspace readily awaiting all our cycling paraphernalia. better still, when it comes to summer, we can sit at the tables outside. but very best of all - debbie's stays open all year round, so there's always somewhere to go to shelter from the wind and rain during the ten months of the year when it's winter. since there is an historical connection between cycling and coffee, that can only have emanated from italy, this availability of virtually any style of coffee you can think of, has attracted a continual stream of visiting cyclists. so life is exactly as it should be in bruichladdich. those of you who attended this year's ride of the falling rain, will have had first hand experience of the espressos that make sundays a delight. of course, such adoration almost demands fripperies; fripperies that are associated with cycling and attractive enough to warrant placing in the pannier or on the shoulders. and it's funny you should say that, because a rather stylish frippery has been uppermost in our minds and design software of late, the result of which can be seen above. of course, such style cannot be admired in such a small format, so if you click the illustration, you will be able to view a larger version of same. now those of us who are dyed-in-the-wool cyclists will need little persuasion to acquire yet another jersey for the collection, but admirers from afar (debbie) needs just a tad more prompting and convincing. so while several summer visitors have asked about the availability of a cycle jersey from debbie's, a smidgeon more convincing wouldn't go amiss. so if you'd fancy one of the projected jerseys, send an e-mail to debbie and let her know. drawing on my ever present powers of ludditeness, i have constantly railed against the integrated headset fashion as well as for the 'what's wrong with the square taper bottom bracket?' line of thought. it can't have escaped your notice, however, that i am a very small voice in a very big pond, and the fact that pretty much everyone has ignored me completely (a situation i am more than used to) hasn't exactly gone un-noticed in washingmachinepost towers. even what i regarded as the last bastion of hope for mankind, colnago bicycles, have reneged on sensibility and popped an integrated jobbie into the latest two frames to exit from cambiago (the eps and cx-1). on the headset front, there are technical and mechanical arguments against - as well as for - the integrated systems, but marketing and manufacturing have effectively made the former all but pointless; they're here and probably here to stay. the new breed of bottom brackets are harder to disagree with, since i am unaware of any mechanical deficiencies that affect the various systems on the market at present. my argument against is based entirely, and perhaps erroneously, on the fact that i cannot see anything wrong with the square taper. much like the insurance added to household purchases, i figure we've been sold something we don't actually need. the cycling world at large either disagrees, or couldn't care less, and to be honest, i can live with that, though it won't stop me being a grumpy old man (my latest career move) about such impositions. however, someone else who has obviously had cause to think long and hard about the change in bb technolgy, is portland resident, chris king. ck components posted on their website more years ago than i can remember, the possibility of a ck bottom bracket, when everybody still used square tapers. but demand for their excellent hubs and headsets, plus the need to keep pace with the fast developing and constantly changing mountain bike hub market, meant that a chris king bb never saw the light of day. at least, not until now. strictly speaking, ck are not offering what we would probably regard as a bottom bracket, since the providers of cranksets do most of that themselves. what they have produced, and no longer with the word prototype emblazoned over the anodised aluminium, is a pair of threaded bearing cups to take the place of those supplied by the likes of shimano, fsa, race face et al. the only person to have fitted production versions to any kind of bicycle is portland frame builder tony pereira, who was given the honour on the occasion of his wedding earlier this month (and what's wrong with that?). 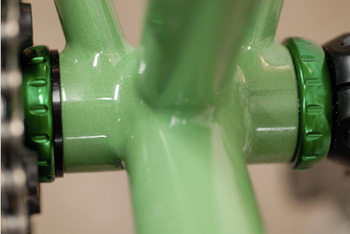 beautifully green anodised bearing cups adorn periera's chris king sponsored bikes constructed for the single speed world championship last weekend. though details of the internals seem still shrouded in mystery, pereira was able to tell that they threaded in smoothly and that they had serviceable bearings. sadly, for those of us with an unbreakable campagnolo addiction, a chris king bottom bracket will merely have to be admired from afar; campag fit the bearings to the cranks and not within the bearing cups. much like chris king freehubs, the bottom bracket cups are not comaptible with vicenza's output. if you really can't bring yourself to fit a shimano chainset, an fsa would seem to be the only viable alternative for the skinny wheels and bendy bar brigade. i am currently awaiting details of price and availability while i search for that fsa catalogue. in the dim distant days of yore, when chris hoy was still a bmx rider, robert millar was riding for a spanish manufacturer of washing machines (you just knew there was a connection there somewhere) and brian smith had bought his first tub of brylcreem, getting to and from islay was pretty much the same as it is today. granted, nowadays we have two ferries shunting back and forward on a regular basis, whereas, in the days to which i refer, one in the morning and one apres midi was your lot - and only one on a sunday. should you have been prudent enough in those days to be a cyclist who wished to visit islay (or any other of the scottish isles for that matter) while you paid for your ticket and some of that lovely calmac food, the bicycle got there for absolutely nowt. however, such are the machinations of the commercial world, when more folks on pedal powered two wheels started to find the western isles an attractive proposition, the pound signs obviously reared their ugly heads in gourock, and the price for carrying a bicycle on a ferry became one pound. granted, this is hardly a king's ransom, but with the numbers of spoked hoops using ferry transport in ever larger numbers, the input to ferry coffers must have been large enough to make it worthwhile having tickets printed. nothing stays the same forever, and it wasn't too long before the price doubled to £2; still not a great deal in comparison to the seventy plus pounds it costs to put a car on the ferry. 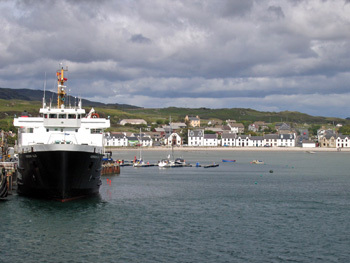 with the opening of a youth hostel on islay in the nineties, and more recently, the opening of port mor centre outside port charlotte, which provides excellent, modern camping facilities, the number of cycling visitors to the island has ramped up quite dramatically over the last few years. and even the guys on the car deck are more inclined to smile, as you ask where you should safely stow your pride and joy. calmac is owned by the scottish executive, and is therefore government funded; it classes the routes to all the western isles as lifeline services, and it might just be beginning to fulfil that description, since the two boats have been in operation for a few years now, but their latest announcement will surely put a smile on all those who hope to join the ride of the falling rain next year, as well as those who will visit for more sedate cycling purposes. the charge for carrying bicycles on calmac ferries has been rescinded; bicycles now go free - all you have to do is buy a passenger ticket. and they say there's a recession looming. in the days of star trek, aside from the dilithium crystals that scotty had to contend with, there was also the anti-matter that kept the whole thing afloat (so to speak), and not anything like anti-pasta. a particle of antimatter will annihilate a particle of matter and vice versa. one, theoretically, cannot exist without the other, and in scotty's time, neither could have existed without gene rodenberry. since einstein had already shown that matter warps space - i have experienced this as i sprinted for the 30mph sign near debbie's - so the enterprise was equipped with a hypothetical warp drive (remember those immortal words 'warp factor nine, mr sulu') which was powered by the antimatter engines discussed above. as already demonstrated (well, sort of), the two types of matter cannot be mixed or there's a severe danger of singed eyebrows. so bearing this in mind, it seems prudent to exercise the same degree of care when using sports creams of opposite tendencies. you just never know. sportique's warming cream pretty much does what it says on the tube; prior to heading out into the weather of your choice, spread this cream liberally and vigorously across those finely chiselled calf and thigh muscles to enhance the blood flow and ostensibly counteract any fatigue experienced during forthcoming exercise. it certainly smells pretty smooth, probably brought on by the capsicum, cajeput and camphor, even though i'm not too sure what they are. while the warming up cream can't really be expected to replace a good dose of stretching prior to cycling, it does appear to make a bit of difference to the 'looseness' of the legs pedalling into what turned out to be possibly the first of the autumnal headwinds. after the 60km ride that followed, during which the wind did not abate (happily it was a tailwind on the uphill bits) and after a quick shower, those same chris hoy lookalike pins were given a liberal covering of the warming up cream's antimatter; cooling cream. this stuff is flipping brilliant - i wish i'd had some of this ages ago. the usual scenario is simply to change after a ride and either slop around the house, or carry out the post ride bike cleaning, but splattering the cooling cream over the legs really does appear to aid recuperation. if there wasn't already a good reason to go out on the bike, there's certainly a good reason for coming home afterwards. 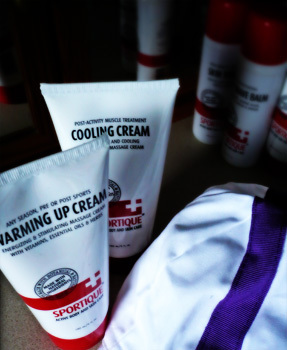 sportique warming up cream retails at £13.50 ($19.95) while the cooling cream manages exactly the same price. just exactly what you'd expect from matter and antimatter (almost). comtemporary jersey designs are well and good, because we demand a bit of modernity to go with the carbon, and to convince all those who didn't watch chris hoy, that cycling is here and now; not something you do simply because you can't afford a car. or choose not to. but over the years, before we hit the busy advertising hoardings currently riding what was the pro tour, there have been some standout jerseys of each era. i'm pretty sure we all have our favourites, allied to perhaps favoured riders (particularly scotsmen with ponytails). 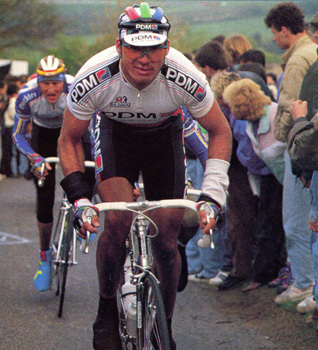 standing a good chance of being in most folk's repertoire is that of the pdm team that lasted from 1986 through to the end of 1992.
this team featured, during its seven years, some of the greats of modern cycling history; steven rooks, gert-jan theunisse, erik breukink (above), sean kelly, pedro delgado and not just a few others. it is of minor note that this team subsequently became festina when pdm pulled out before the 1993 season - of minor note because their jersey wasn't the best i've ever seen, and has a notoriety none of us would want on the bicycle. the pdm jersey was worn effectively to wins in many of the major classics while it featured in famed riders' wardrobes, and just so that we can re-live those halcyon days, retro specialists prendas ciclismo have resurrected the design from the vaults. manufactured from modern textiles by ultima, the original supplier to the team, the jersey is available in short sleeves only and is due in early september. pre-ordering is currently available from for only £39.95 ($75). you'd need to be a really weird shape or size not to find one to fit, since it's available in sizes small, all the way up to xxxxxxl. and just to round out that classic look as we enter classics imbued weather, you can top the jersey out with a pdm casquette for a mere £6 ($12). and didn't you always wonder what pdm stood for as well? if pink is the new black, and lime green is the new pink, then houndstooth is the new argyle. mark my words, by this time next year, garmin chipotle will have cast aside the argyle portion of their jerseys and a subtle hint of houndstooth will start to appear. or maybe not. because while panache cycle clothing of boulder colorado do provide a training top with a dash of argyle, the review jersey sent was the houndstooth, a jersey design of which i am very much in favour. don powell, progenitor of this newest line of cycle clothing, was a professional rider in europe in a previous life, so the man has more than an inkling of what constitutes a cycle jersey that we would all be happy to wear when plundering those training miles. the philosophy goes that, as a team rider of whatever level or category, it's nice every once in a while, to swap the trade or team jersey for something a little less billboard in outlook; something that will look pleasantly stylish when supping a double espresso and dropping crumbs of lemon and orange cake all over the floor. it has been commented on, in the ardbeg peloton, that after a hard slog into a headwind, augmented by the occasional shower, there is a tendency to drape oneself over the chairs in debbie's. the secret is to drape oneself in a manner that looks less landfill and a bit more joie de vivre. the eleven bibshorts are indeed named in respect of that movie, perhaps to flatter that they may just be that bit better than the competition. in which case, they are very aptly named. i have singularly failed to fathom the different sizing options for bibshorts from any manufacturer; having remained the same size for many a long year, i have shorts currently in my cycle wardrobe in small, medium and large, all of which fit just dandy. i'm a thirty inch waist and five foot ten in height - don sent me a pair of medium eleven shorts, and the fit is impeccable. i remember saying several thousand pixels ago, that if the shorts can be pulled on very easily, you've probably bought the wrong size; the panache shorts took a bit of effort to pull on, demonstrating just how well mr powell knows his cycling apparel. the insert, in common with many independent makers these days is from cytech, in bright yellow. after 60km, some of which were in the midst of precipitation, my bum complained not once. the pad cossets the gluteus maximus with elastic tenacity; where you move, it moves. the bib top features a perforated mesh that fits seamlessly under the jersey, staying put and without rubbing or digging at the shoulders. 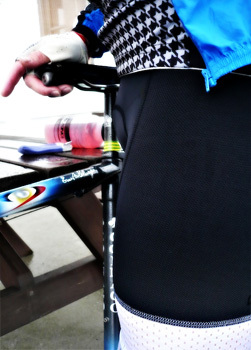 this augurs well as we move into the season for wearing bib tights over shorts to keep the weather at bay. the really clever bit on the panache shorts is the gooey gunk that holds the legs in place while pipping boonen for the sprint. panache have developed a method off applying the grip directly to the fabric, leaving the hem no thicker than the rest of the short. there is a white perforated front panel on each leg which must contribute to the 'i've forgotten to put my shorts on' feeling engendered while pedalling frantically or even sedately. so the legs don't creep upwards at all, yet there feels to be no pressure from any part of the garment. quite fabulous, and quite unique. the word panache is featured in black on the outer reaches of each leg, and coupled with the white front panel, these look very stylish indeed (even on me). 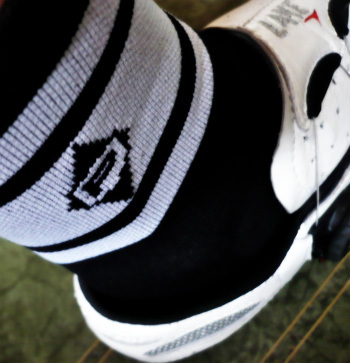 rounding out the corporate image, were a pair of panache socks, in lance armstrong black with white hoops on the ankle section, and a panache logo on each side. the lake shoes are a 44, and the socks tested were medium; the fit was pin sharp, as was the function. i still maintain that the best compliment you can pay a pair of socks is that, like party political broadcasts, you don't notice them. they can aso be had in a reverse of this colour scheme, as well as a pair with a white diamond patter across the ankle. so altogether a very fine debut for a design led clothing company. while great attention has been paid to the look of the garments, we're not looking at a triumph of form over function here; this stuff works very well indeed. so if you end each training ride unwashed and somewhat slightly dazed, therefore needing some assistance in the sartorial department, panache is yours. or at least it is if you want to order from the panache website. european distribution is still in the 'we're working on it, honest' stage, but it shouldn't be too long, one hopes, before it will be so easy to have all the panache a guy can get (currently, there is no women specific range). 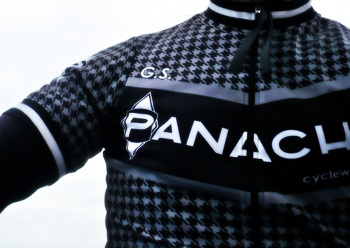 the panache houndstooth training jersey retails at $140 (approx. £75); the eleven bibshorts at $240 (approx. £130) and the socks at $12 (approx. £6.50).